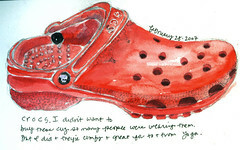 These 'Crocs' are really comfy and perf for going to and from yoga. Red, of course. "Don't wait for inspiration. It comes while one is working." Henri Matisse. I read that in my march/april issue of Cloth Paper Scissors. Oh yea, that's the issue with a page from MY sketchbook on the cover!! 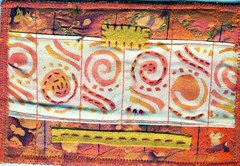 One more fabric postcard (with hand-carved stamp made into stencil). This one has burned lutradur too, and felt. I plan to get back to my sketchbook tomorrow...still got another robe and slippers to do! 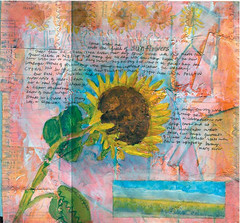 These fabric postcards (4x6") were made with my hand-carved stamps,then I made a stencil from the stamp image, then used paintstiks to color. They are way fun and easy to spend hours on. 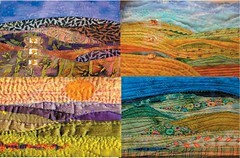 Another landscape quilt. 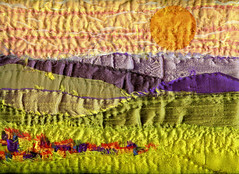 This one "Troublesome Lemon Moon" is made from dupioni silk and is about 9x12." 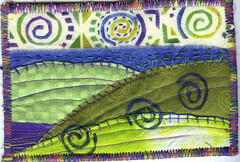 The next session of Art Quilt Exploration that I'm teaching starts on March 16, through Oceanside Museum of Art. 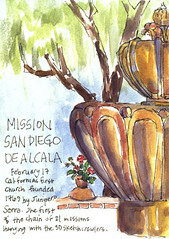 The San Diego Sketchcrawl group spent most of the day sketching at Mission Alcala--the first mission in California. The weather was perfect--like 80 degrees! We watched a wedding, and did commentary on all the dresses. Very nice day, and the grounds of the mission are so beautiful. That's a large fountain on the right, incase you couldn't tell. I tried to get creative with the placement and cropping, ala my current fave artist mrana but I've got a ways to go..
My summer robe. I got this cotton kimono-style robe in Japan in 1989. I have such fond memories of that gorgeous country. I sort of mucked up this painting when I tried to add some more shading without wearing my glasses. oops. Another Jim Dine inspired image, this time of my lavendar fleece bathrobe. I always say I'm going to do a series, and then poop out after just two. My plan is two more robes to complete this 'series.' East coast Janey wonders, does everyone have a robe or collection of robes? I have 3, two winter and one summer. Just one pair of slippers though. I sketched at a reception last night, with my good pal Helen, at our 10 North gallery. Chatting, drawing, drinking champagne. Yup, it works for me! Had to two draw these two newcomers to my collection of metal birds. 7 birds, 2 rabbits so far. Andrea and David from Wonder Channel came over today to do the final filming for the DVD. We shot the introduction and a couple of scenes in my studio, and the rest we shot in September in a local video studio. 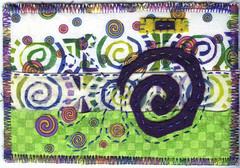 The finished product of yours truly teaching three art quilt projects, will be out in a couple of months. Martha and Pokey, you know you'll get copies to review!! 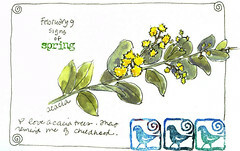 Acacia branch and hand made stamps. 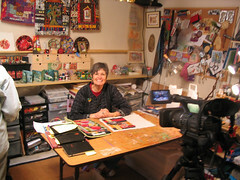 Hey, I've got another 6 week art quilt class starting Friday March 16 at the Oceanside Museum of Art. Register now. 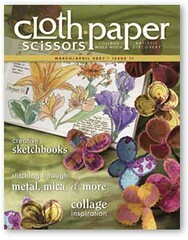 I just found out that MY sketchbook page is on the cover of the upcoming March/April issue of Cloth Paper Scissors!!! I knew the article I wrote, and images from my sketchbook were going to be in this issue....but being on the cover! WOW! Can you tell I'm excited.?!! You can buy the magazine in stores after March 1. Today is our 30th wedding anniversary. Husb gave me a beautiful romantic card, and surprised me with a very thoughtful present. Ahhh. Then lunch (you can read what we ate. Delicious!!) at The Inn at Rancho Santa Fe. 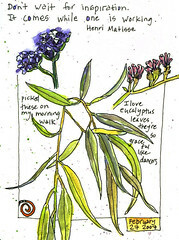 After lunch, we two sat in the garden and sketched for 30 minutes or so. It was probably 75 degrees and a gorgeous and memorable day. I am very lucky. Everyday matters.... 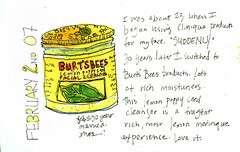 I love Karen's blog and how she selects simple everyday stuff to draw. I could have worked a little harder on lettering, but oh well. Here it is, with color. I used my water-soluable crayons and it's interesting how they influence the color choices vs. what this would look like with color pencil. Not my usual color palette, but fun to do. This could be crop circles, or a 1950's dress print or the los angeles freeway system...It's just giant doodle in my sketchbook moleskine. I'll probably add color today.